Yesterday, Hasbro held their own New York Comic-Con panel where the company unveiled their new toys from Rogue One: A Star Wars Story. 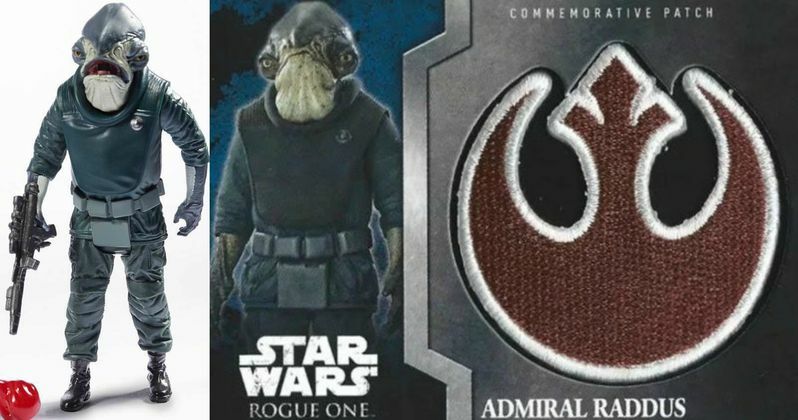 One of these toys was of particular interest to many fans, since it gave us another look at the new Mon Calimari character, who we now know is named Admiral Raddus. While there still isn't too much we know about this character, a few new details did surface. Fans got their first look at this character during a sizzle reel that debuted at Star Wars Celebration back in July. It wasn't known what the character's name was at the time, but it was clear that this creature was a Mon Calimari, the same species as the beloved Admiral Ackbar. Then in August, StarWars.com posted an article that listed a few things fans may not know about the Mon Calimari, with Star Wars Story Group's Pablo Hidalgo offering some new details, although he didn't reveal the character's name. Here's what he had to say below. "Rogue One will show us Mon Cal from the colder polar extremes. Ackbar and the other ones we've seen so far are more tropical (and colorful)." This Mon Calimari's name Admiral Raddus was finally unveiled during the New York Comic Con panel, although no character details have been revealed, and it hasn't been confirmed who is playing him quite yet. There is no Admiral Raddus listed on Rogue One's IMDB page, and it isn't clear if he has a large or a small role in this Star Wars spin-off. It also isn't known if Admiral Raddus has any relations or connection to the beloved Admiral Ackbar, who returned to the big screen in Star Wars: The Force Awakens last year. Back in July, there was another report that one of the new Rogue One toys debuting during Force Friday was a "Mon Calimari Cruiser," which lead to speculation that Admiral Ackbar would return in some fashion in Rogue One: A Star Wars Story. There was also a report from February that Tim Rose, who played Admiral Ackbar, had to cancel a convention appearance to work on a movie, with many speculating that movie could be Rogue One: A Star Wars Story. Still, Admiral Ackbar's presence has yet to be confirmed in Rogue One: A Star Wars Story. So perhaps Tim Rose is playing this all-new character. Admiral Ackbar didn't appear in a live-action Star Wars movie until Return of the Jedi, but in the expanded universe he had a long history fighting against the Empire and as a Rebel leader. Rogue One takes place in the time period between Revenge of the Sith and A New Hope, and it revolves around the band of Rebels who stole the plans for the original Death Star. Ackbar was critical in the assault of the second Death Star in the Mon Calamari Cruiser, partially by realizing that the Empire had pulled an elaborate ruse on the Rebels. Take a look at these new toy photos below for Rogue One: A Star Wars Story, arriving in theaters December 16.